Description: Backstrap looms are very ancient, simple looms that are still used by indigenous weavers around the world to weave everything from narrow simple bands to wide pieces of cloth with complex patterns. They are nothing more than sticks and yarn tensioned between a stationary object and a belt or strap worn around your hips, which makes them cheap, easy, and quick to make as well as lightweight, portable, efficient, and compact. Ready to give it a try? 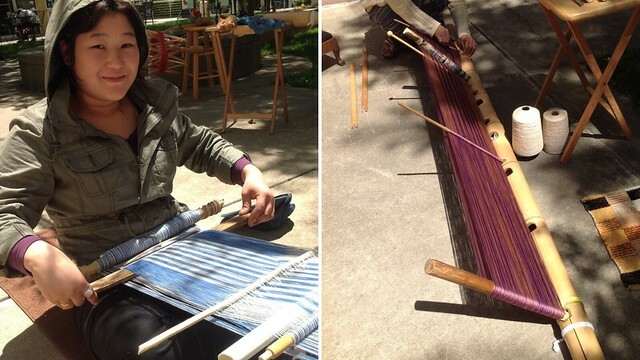 In this workshop, you'll learn how to set up your loom, measure a continuous warp (in the ancient Karen weaving tradition) , make a cloth belt/backstrap, make string heddles, tension your warp, and weave about two yards of 6-inch wide plain-weave cloth on your new loom. Junco Sato Pollack (MFA, Textile Design, Rochester Institute of Technology 1991) is an artist and retired Associate Professor of Textiles at the E. G. Welch School of Art and Design of Georgia State University in Atlanta, GA, where she served 1992 – 2012. Native of Japan and having lived in the United States for over 30 years, Pollack creates Zen-inspired meditative, abstract art textile works, fusing the Eastern aesthetics and sensibility with the kinetic energy of the West, and incorporating chance composition. Junco’s works are installed as architectural accents in atriums, hotels, corporate offices, and private residences in the USA and abroad. Her works are housed in the permanent collection of the Museum of Art and Design (MAD), New York, the Francis Loeb Library Materials Collection of the Harvard Graduate School of Design, and the Wallace Library Collection of RIT, Rochester, New, York, and are included in numerous corporate and private collections around the globe. Her works are exhibited internationally in 30 cities in 13 countries around the globe in the past 20 years. ​Additional Supply Fee: $60 payable to the instructor on the first day of the workshop for black bamboo loom parts, a wood sword beater, a bamboo cloth beam, dupe-heddle linen strings, and plastic netting shuttles. If you have trouble registering or paying (Safari users!) or if you are concerned that this website does not have an https address, please use the following direct link for registration and payment: https://sefaa.secure.force.com/Programs/CnP_PaaS_EVT__ExternalRegistrationPage?event_id=a0u0V00000m9MQPQA2.